Arizona Hardwood Floor Supply has been installing and servicing all types of wood flooring for commercial construction and renovation projects throughout the Valley for over 30 years. From schools to casinos, museums, office buildings and restaurants to name a few we offer custom hardwood flooring and refinishing. We are also experts at restoring luster and shine to existing flooring. In 2012 we had the pleasure of working through AR Mays Construction installing flooring at the Ak-chin Casino Entertainment Center in Maricopa, AZ. Using Oregon Lumbers Brazilian Cherry hardwood flooring we installed flooring on the main staircase treads, risers and landing. In addition we also completed their stadium seating. Brazilian Cherry is found in several countries including northern Brazil, Peru and the West Indies. Most notably known for its hardness and durability it bears a beautifully, warm reddish tint. With a Janka hardness scale of 2350, Brazilian Cherry is an extremely dense wood in fact, it’s roughly eighty-one percent harder than red oak, seventy-eight percent harder than ash, about sixty-two percent harder than hard maple, close to twenty-three percent harder than jarrah, and is just over six percent harder than Santos mahogany's ranking of 2200. The Janka scale is based on the industry standard hardness test for gauging the ability of various species to tolerate denting and normal wear, as well as being a good indication of the effort required to either nail or saw the particular wood. It involves a measurement of the force necessary to embed a .444-inch steel ball to half its diameter in wood. Dedicated to keeping your hardwood floors beautiful! Our commercial hardwood flooring team is extremely knowledgeable and would be happy to sit down with you and recommend the ideal products and installation methods for your floor. We understand the different requirements for various types of commercial wood flooring based on use, traffic, location, maintenance and other factors. In addition we can also restore and refinish the existing wood flooring in your commercial space. Many commercial wood floors experience high levels of traffic and require regular maintenance such as light buffing or sanding and recoating with protective sealant to maintain a pristine surface. 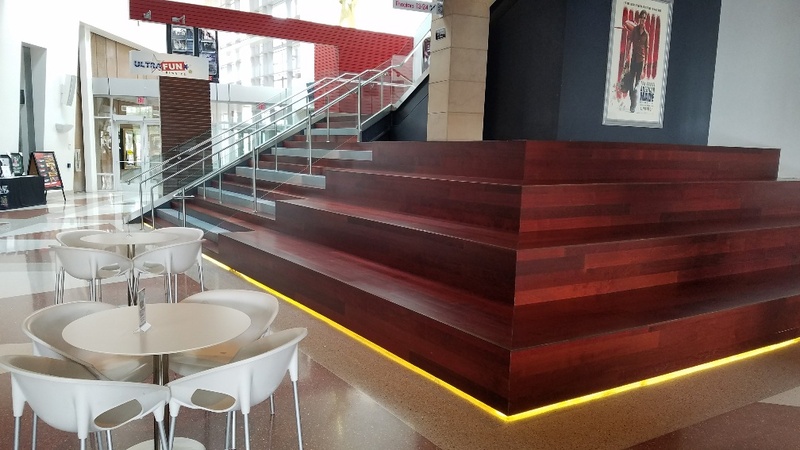 For more information on commercial flooring installation or any of our other services, please contact Arizona Hardwood Flooring Supply or call our General Manager, Jimmy Waters at (623) 742-9663 (WOOD). If you would like to talk to us in person stop by one of our convenient Valley locations to discuss your project.